When I saw that Boots were selling the Miss Patisserie collection which has bath bombs, bath melts and other bath delights I decided I needed to give them a go. We all know how I feel about Lush and the way they are in the bath and I am always up for a nice hot bath to wash any worries away. I was drawn to the white bath bomb with tiny bits of colour dotted on the top with the name 'colourfest' this seemed unusual for such a plain looking bath bomb, so I knew it had to be on the list to see what it did in the bath, it had to be interesting right? The bath bomb was an intriguing one, white with spots of green and red on the top and I can only assume is the Himalayan sea salt on the top of the bath bomb to detoxify, de-stress and relax the muscles. On the surface it looks quite plain but the name gave me hopes of a big surprise in the water. I found the smell to be really nice, on the floral end of things, and not too over powering which I think is great as I don't enjoy really overpowering scents when I want to use a mixture in the water. I dropped the bath bomb into the water and initially the white began to fizz away which I expected, it created a milky, cloudy looking water to begin with before any of the colour came out of the bath bomb. Once I let go the bath bomb did sink to the bottom which was a shame as even with other bath bombs I have used they just don't make the same effect when they sink, so I was a bit disappointed but I lifted it back up and held it while it fizzed away in order to share what it looks like with you. When sunk the water just seemed to change colour slightly as it fizzed but you couldn't see the colours as well, it began fizzing a purple like shade, but when I pulled the bath bomb to the surface it had a beautiful vibrant blue and a bright pink that were fizzing away and creating a beautiful shade in the water. Though the water had a purple tint from the pink and blue mix, the blue did over power the pink and the water became a lovely vibrant blue. I think the bath bomb was really lovely, and while it did sink and give less of an effect with the colours unless brought up to the surface if you want to watch it fizz away, as I do to get pictures and review, some others in the line may not sink and I may have just got one that did. I know with Lush at least I have had ones that sink and then seen reviews of the same one only to see it floating happily across the water as it dissolves.... I feel like for £4.50 they are a competitive price for the market, and at least in my home town one of very few bath bombs I could pick from should I not be able to get to a city to get to somewhere such as Lush. 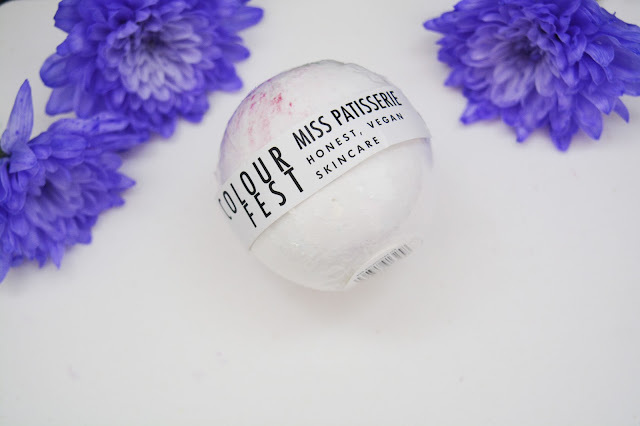 You can find this bath bomb on Boots here if you want to read more or find out more about the brand but it is definitely a brand I want to try more from as this was nice, even if not as colourful as I hoped! Do you think this is a brand you would want to try?